New students must first SIGN UP with ticketnomore.com. You will be asked to select your State, Court, and Jurisdiction where you received your ticket. 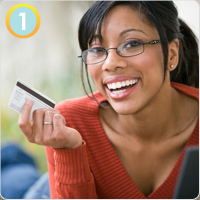 Once you have done that fill out our simple registration form and choose your payment option. Payment can be made now with a credit card, debit check card or you can choose to pay later by money order. Once your payment is received and verified you will have access to the study section. It is that simple to sign up. Our payment processing is secure and guaranteed against fraud and theft. Your personal information cannot be shared. We accept VISA MasterCard, American Express and Discover. If you need assistance during this process you can call us toll free at 1-877-837-5722. After payment has been accepted you can move onto the study section. Read at your own pace and login and logout as many times as you need to complete the course. You can take the quizzes as many times as you need to successfully pass to the same questions in the final exam you can take twice at no extra charge. On the Check Prices section of the website you will be informed of your county's requirements. NOTE: You must have a minimum passing grade of of 70% to receive your certificate. Once you have passed the course most courts allow us to send the certificate directly to the court on your behalf, these courts will be indicated during the registration process. For some courts we offer USPS and Overnight Delivery. We offer options of Same Day Processing and Express Delivery available for most courts for those with last-minute due dates. If you have any questions call us toll free at 1-877-837-5722.